The Soccer Star’s first season. See how his shorts and socks meet? So cute. We went to my son’s end of year soccer presentation on the weekend. 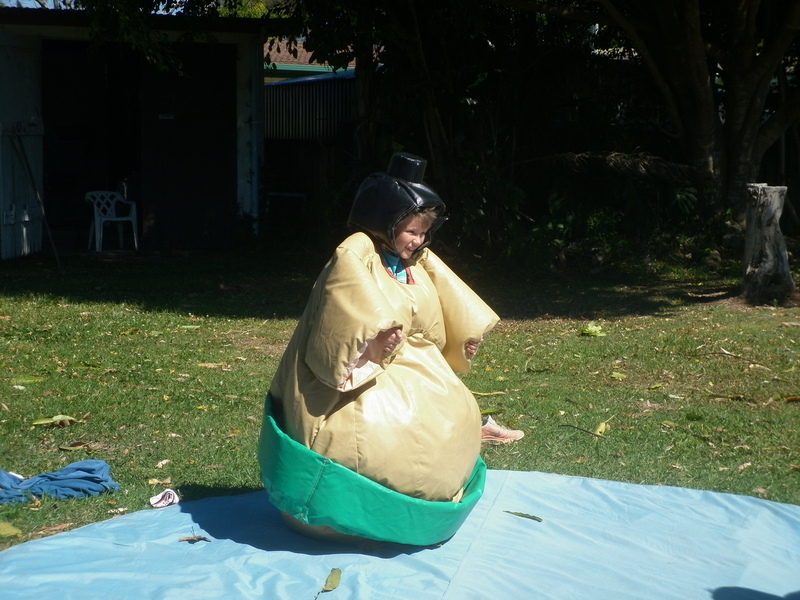 His club had planned a day of childhood bacchanalia – jumping castles (3), wrestling in sumo suits, slushies, fairy floss, popcorn, mixed ages soccer and lunch. As you can imagine, they had a maaad time 🙂 It was also the first time either of my children had a slushie (a brightly coloured frozen ice drink) or fairy floss – the Soccer Star informed me later that he had eaten two lots of fairy floss because there were two different flavours he wanted to sample. Seriously. Sugar spun until it is light and fluffy isn’t enough – they have to flavour it as well? So now the Bear wants to get more involved with the club. Or to be more precise, he wants us to get more involved. This is not coming as a surprise to me; in fact I thought it would have happened before now. The Bear owes a big debt of gratitude to his mother who drove him and his brother all around the state playing representative soccer. She was also heavily involved in the soccer club and managing the teams. I, well…an image comes to mind of a person being bodily dragged , fists clenched. I guess I have been a little resistant 🙂 To be fair, up until fairly recently I have been involved in other community activities that have taken up all of my time and energy…but now that I am not, I still find myself holding back. Why? I like communities. I think sport is good for communities, and I like to be a part of things. Why not this? Oh, I don’t know. It’s probably something to do with my anti-competitive, anti-sport upbringing. We just didn’t have a sporting culture in my house. This kid’s sport thing is completely new to me, and the culture around kid’s sport is new too. My mother told us that we were welcome to do whatever sport we wanted to – as long as we got ourselves there and back, and presumably paid for it as well. To be fair, this was not an uncommon attitude at the time – 1980’s rural Australia, 45 minutes from the nearest town, low incomes – most parents thought the same way. It didn’t bother me particularly – I never wanted to play sport anyway – I was a studious books and music type of person. Now that I have my own children, however, I feel a bit differently about it. Just because the Bear and I have chosen to live in a rural area doesn’t mean that my children should have less options. My son goes to a tiny country school with a limited sports program. Because of this I feel like I have a responsibility to provide after-school sport for my children. 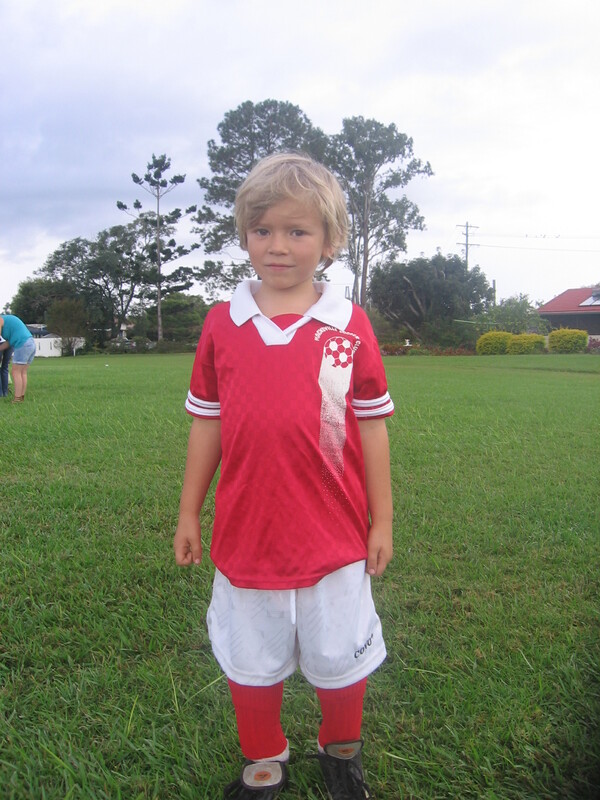 In fact, most of the kids in the under 9s soccer team are from various small schools in the area. Sport is the great leveler, especially when you’re a boy. Through soccer, he knows kids from lots of different schools from around the valley – he doesn’t know how important a wide social circle is yet, but I do. And it goes without saying that the health and fitness benefits of playing sport are vitally important, as is learning how to play as part of a team. So, I’m thinking to myself, maybe I’ll give it a go. Like the Bear said, I could create a social media profile for the soccer club. Make them up a facebook page. Promote the club a bit better. Create better communication channels within the club. When you put it like that…it kind of sounds like things I do for fun. Right? The Soccer Star has informed me that he would like to be a Cricket Star this year as well. The junior cricket season starts in 6 weeks. We did try this a couple of years ago, but he dropped out only a few weeks into the season. I know he loves cricket though. He probably loves the actual game more than soccer to be honest. The last two summers he watched and played cricket almost every day. I now know how to bat, field and bowl much better than I have ever been able to before. Granted, I was starting from an extremely low standard to begin with, but still. So we’ll give cricket another go this year. Why not? It sounds fun. So what do you think about kid’s sport? Do you take your kids to sport? What were your experiences of sport when you were a child? So, I was not into sports as a kid. My husband was. Big time. My kids are athletic, and sports is huge in our little midwestern town. I go back and forth on the issue. I think it is a wonderful self esteem boost for my kids, and I love the way it teaches them to practice something in order to get better at it. I do NOT like mean coaches who only care about winning. I DO NOT like it when they get hurt. I guess you have to take the good with the bad on anything. But, I’m extremely flaky on this issue. I lOVE the sumo outfit. That is HILARIOUS!!!! Hi Lis, I haven’t experienced mean coaches or injuries yet…or even weird, rabid sports parents! I know they are out there, and I know that there are negatives to the sports culture. I am still quite repulsed by sports culture as a whole. It will be interesting to see how I deal with it when it does it arise! I was never a sporty person either and I definitely worry about the day my future kids might come up to me and say, “Hey Mom, I want to do this sport!” Yeah, I’m not really interested in being a soccer mom to be honest but I suppose if my kid is really passionate, I’d have to cave sooner or later….. Believe me, and this is coming from someone who has no interest in sport whatsoever, your priority will be what is best for your child. Health, fitness and social development are priorities of every parent. Not that every child is going to be sporty either – god knows I wasn’t!